POINTS AND FIGURES: The Secret No One is Talking About Buried In Obamacare. Obamacare is a total fail. It’s too clunky. They didn’t exactly use Lean Startup principles when they wrote the bill. One of the goals of Obamacare which I agree with in principle is to separate employment from health insurance. Tying them together creates all kinds of poor economic incentives. But, the ACA law is littered with even worse economic incentives. One of them is mobility. And baskets of government lies … Like the social security lock box. Top Dem: Those aren’t ‘cancellation notices,’ they’re ‘transitions’… Transitioning to higher prices . It’s Not a Broken Promise if You Never Meant to Keep it …. Here’s the ObamaCare rollout in two sentences: Millions of Americans are losing their health insurance policies because of the law. And many of the soon to be uninsured can’t sign up for the new federal benefits because the Obama administration screwed up its Web site. WASHINGTON POST: Kathleen Sebelius, welcome to an unwelcome Washington tradition: The deathwatch. Pay attention little kiddies and you might learn how BIG GOVERNMENT really works. 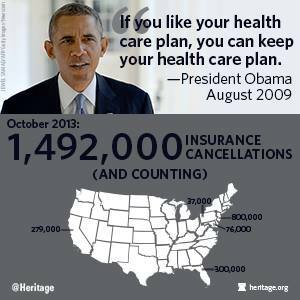 Health industry experts are now saying as many as 16,000,000 policies will be cancelled. Hwo else could they sell it??? Thanks to ObamaCare, New Yorkers can now get health insurance with rainbow sprinkles. It was designed to force people to a single payer medicaid solution, which is what is described in these following CBS reports. Medicaid Is Obamacare … The Latest Sleight of Hand. $700 Billion was taken from Medicare to fund Obamacare … Medicare and seniors lose. Betsy McCaughey would agree, as she was on with Megyn Kelly last night to discuss the fact that Obamacare was designed to push people into Medicaid. Why? Because is a single payer system and that’s what they believe in, McCaughey said. The unintended consequence of central planners … As it goes with most liberal government programs. And the wrong people are signing up … Those that cannot pay. Healthy young people must pay the fright or the system will collapse.